The French automotive television show “Turbo” came out to Formula Drift Round 4: After Dark and filmed a short segment with Stephan Verdier. It begins roughly at about the 15 min mark. Warning it is in French, but has some cool action. 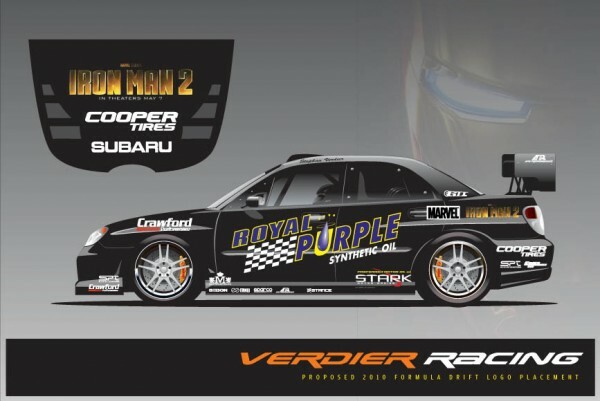 Stephan Verdier Racing joins forces with Ignite Fuel as a new partner for the 2010 Formula D Season. For the 2010 season the Stephan Verdier Racing Team will be going green, and we dont mean the color. 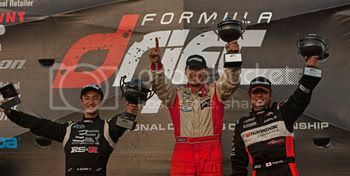 We are happy to partner with Stephan and his team, and look forward to showcasing Ignites power in the 2010 Formula D Season, says Reggie Henderson, President of National Biofuel Distribution. Ignite Fuel was developed by a bio-fuel company specializing in race fuel called National Biofuel Distribution. According to Stephan Verdier, I’m very excited about running an alternative fuel, it just goes to show you can go green and still go sideways. From what Ignite Fuels has told us they are unlike any other race fuel, providing an ethanol based race fuel that is not E-85. We happen to be the lucky recipients of their 114 octane fuel; it’s like E85 on steroids. With the extreme blend Ignite Fuels is offering, not only is it a green (healthy for the environment) but it allows Crawford Performance the option of making more power while keeping the engine temperature much cooler. In drifting we are always trying to find new ways to make more power, and overheating has made that a problem, especially when the drift cars are always sideways. With Ignite fuel we take care of both these issues. The one concern Crawford Performance brought up was the consistency of the fuel. Ignite Fuels has made it very clear every batch is thoroughly tested to ensure consistent quality and/or grade level within every batch they produce. This is just one more advantage we will have over the competition in the run for the 2010 championship. Tracy Itzen, President of Itzen Media says Ignite Fuel was created around listening to what the drivers needs and wants were in a race fuel. Ignite Fuel is consistent, has already proven gains, and is affordable for everyone.